The IBWA becomes a 2018 National Sponsor of Keep America Beautiful's America Recycles Day. DALLAS, January 17, 2018 /3BL Media/ – With a common goal of improving recycling access and increasing recycling rates by educating consumers about the value of recycling, the International Bottled Water Association (IBWA) and Keep America Beautiful announced their partnership today at the 2018 Keep America Beautiful National Conference, taking place Jan. 17-19 at The Fairmont Dallas Hotel in Dallas, Texas. IBWA will become a national sponsor of America Recycles Day, a Keep America Beautiful national initiative that takes place annually on and in the weeks leading into Nov. 15. It is the only nationally recognized day dedicated to promoting recycling in the United States. America Recycles Day educates people about the importance of recycling to our economy and environmental well-being, and helps to motivate occasional recyclers to become everyday recyclers. “The International Bottled Water Association is very excited to be working with Keep America Beautiful on this shared mission to improve recycling,” says Joe Doss, IBWA president and CEO. “The bottled water industry has for many years worked hard to proactively encourage consumers to always recycle their empty bottled water containers. All bottled water containers are 100 percent recyclable – even the caps. The fact that our containers are so easy to recycle, where facilities exists, is more important than ever now – as there are more and more opportunities for these recycled containers to have a second life, not only as new bottles but also shoes, clothing, outdoor decking, furniture, playgrounds, and more. “This new partnership with Keep America Beautiful will help IBWA expand our current efforts to encourage consumers to always recycle their bottled water containers with caps on, while at home or on the go, while bringing a new focus to reach and change the behavior of those who are currently less inclined to participate in recycling,” Doss said. “It’s our aim to teach Americans the importance of recycling right – recycling clean, uncontaminated materials correctly – and to encourage buying products made from recycled content,” said Helen Lowman, president and CEO, Keep America Beautiful. “Partnerships with industry stakeholders such as the IBWA and the support of programs like America Recycles Day are critical to help raise awareness to improve recycling participation and access. “We stand committed to helping Americans better understand recycling and its potential for economic, environmental and community benefits by working with all stakeholders – manufacturers; the waste management industry; government entities; other nonprofit organizations; trade associations and beyond – to make recycling more sustainable and a daily social norm for all people,” Lowman said. Bottled water is now America’s favorite drink, surpassing carbonated soft drinks in 2016 (by volume) for the first time in history. Bottled water drinkers are already more inclined to recycle their empty containers. 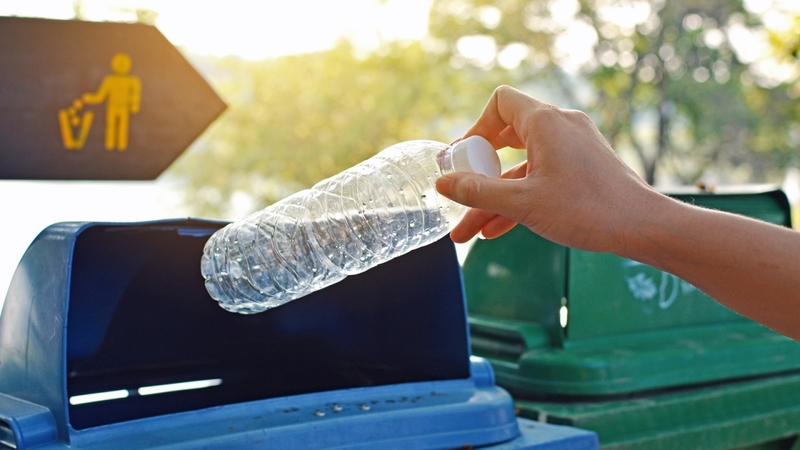 A 2016 PET plastic bale analysis study done by the National Association of PET Container Resources found bottled water is the No.1 most recycled product in curbside recycling systems, with a rate of 53.1 percent, compared to soft drink bottles, which was 20.4 percent. “While a 53.1 percent recycling rate may be better than all other beverage products, we know there’s room for improvement,” said Doss. As people shift away from less healthy packaged drinks and choose the healthiest option – bottled water – they should be glad to know that they are also choosing a beverage that has the smallest environmental footprint. Bottled water has the lowest water and energy use of all packaged beverages. With an average weight of just 9.25 grams, bottled water containers use far less PET plastic than carbonated soft drinks and other beverage packaging, which on average weigh 23.9 grams per bottle. For more information about recycling bottled water containers, visit www.bottledwater.org/education/recycling. To learn more about Keep America Beautiful and to donate, please visit KAB.org/donate. The International Bottled Water Association (IBWA) is the authoritative source of information about all types of bottled waters, including spring, mineral, purified, artesian, and sparkling. Founded in 1958, IBWA's membership includes U.S. and international bottlers, distributors and suppliers. IBWA is committed to working with the U.S. Food and Drug Administration (FDA), which regulates bottled water as a packaged food product, to set comprehensive and stringent standards for safe, high-quality bottled water products. In addition to FDA regulations, IBWA member bottlers must adhere to the IBWA Bottled Water Code of Practice, which mandates additional standards and practices that in some cases are more stringent than federal and state regulations. A key feature of the IBWA Bottled Water Code of Practice is a mandatory annual plant inspection by an independent, third-party organization.